Illuminance is the measure of the amount of light received on the surface. It is typically expressed in lux (lm/m2). 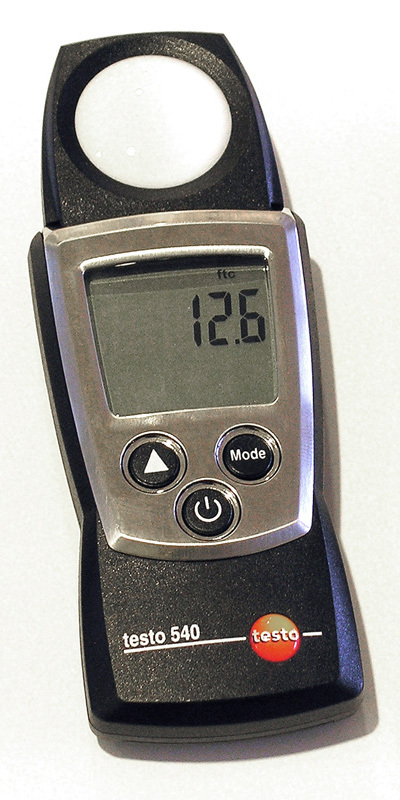 Illuminance levels can be measured with a luxmeter, shown in Figure 1.7.2, or predicted through the use of computer simulations with recognised and validated software (e.g. 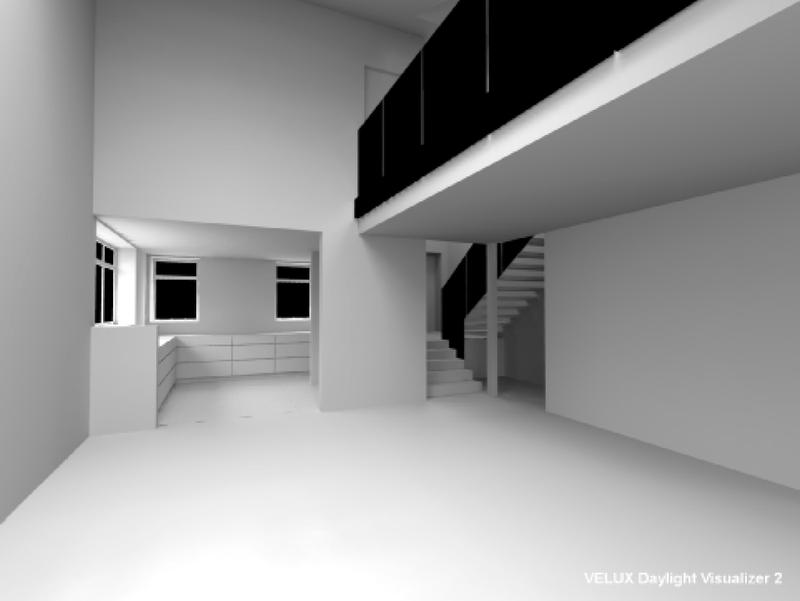 VELUX Daylight Visualizer). Figure 1.7.3 shows an example of an illuminance rendering. Illuminance is the measure of light currently used by most performance indicators to determine daylight availability in the interior. Illuminance (lux) is the measure of the amount of light received on a surface. It is the measure of light currently used by most performance indicators to determine daylight availability in the interior. Figure 1.7.3 Illuminance renderings of Maison Air et Lumière. Luminance is the measure of the amount of light reflected or emitted from a surface. It is typically expressed in cd/m². 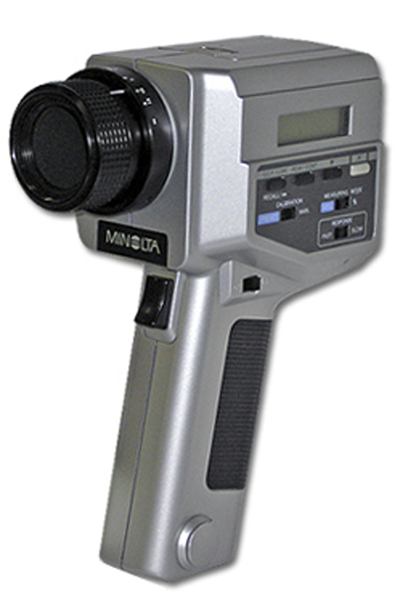 Luminance levels can be measured with a luminance meter, shown in Figure 1.7.6, or through the use of high dynamic range (HDR) imaging techniques together with a digital camera and luminance mapping software (e.g. Photolux), example shown in Figure 1.7.7 Luminance levels can be predicted through the use of computer simulations with recognised and validated software (e.g. 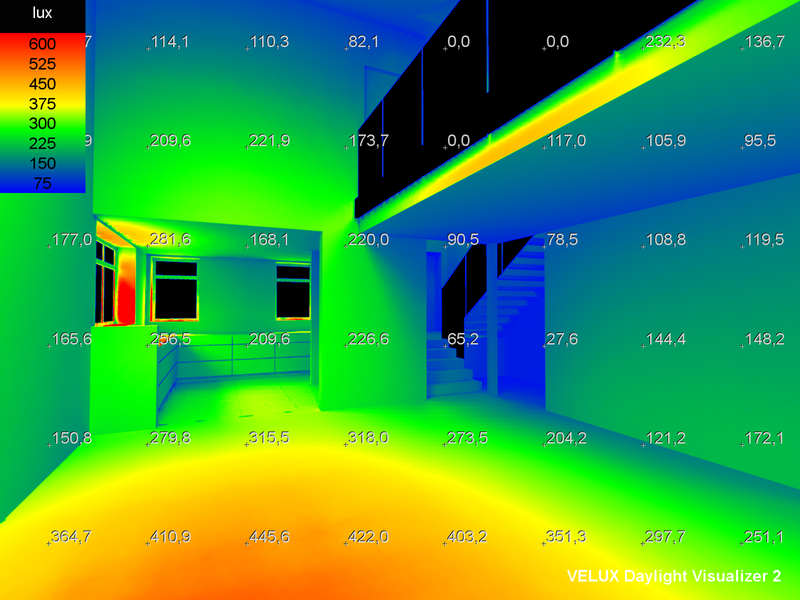 VELUX Daylight Visualizer). Figure 1.7.8 shows an example of a luminance rendering. Luminance is the measure of light used to evaluate visual comfort and glare in the interior. Figure 1.7.5 Cool pix camera and fisheye lens used to create luminance maps. 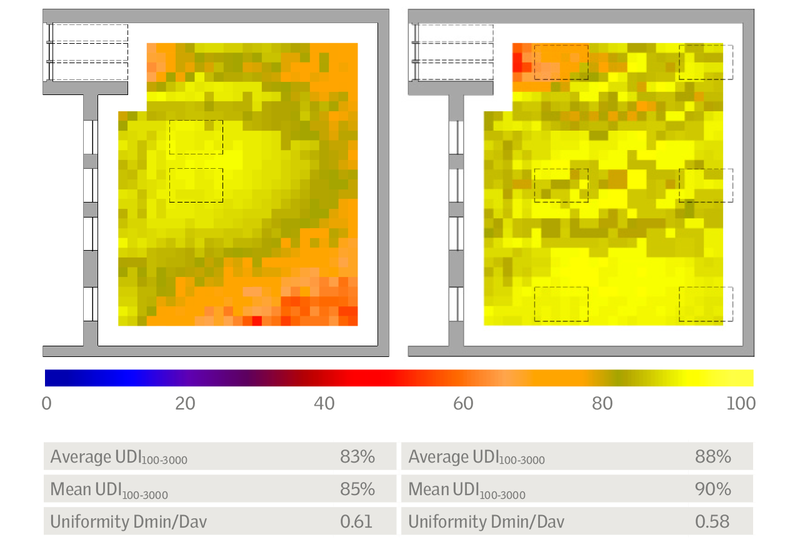 Figure 1.7.7 Luminance map showing the distribution of luminance values in Atika, a concept house by VELUX, under overcast sky conditions. Figure 1.7.8 Luminance renderings of Maison Air et Lumière. Luminance (cd/m2) is the measure of the amount of light reflected or emitted from a surface. It is the measure of light used to evaluate visual comfort and glare in the interior. Daylight factor (DF) is a daylight availability metric that expresses as a percentage the amount of daylight available inside a room (on a work plane) compared to the amount of unobstructed daylight available outside under overcast sky conditions (Hopkins,1963). • The size, distribution, location and transmission properties of the facade and roof windows. • The size and configuration of the space. • The reflective properties of the internal and external surfaces. • The degree to which external structures obscure the view of the sky. The higher the DF, the more daylight is available in the room. Rooms with an average DF of 2% or more can be considered daylit, but electric lighting may still be needed to perform visual tasks. A room will appear strongly daylit when the average DF is 5% or more, in which case electric lighting will most likely not be used during daytime (CIBSE, 2002). Figure 1.7.9 Drawing showing the values measured by the daylight factor method (simultaneous reading of the internal and external (unobstructed) horizontal illuminance levels). 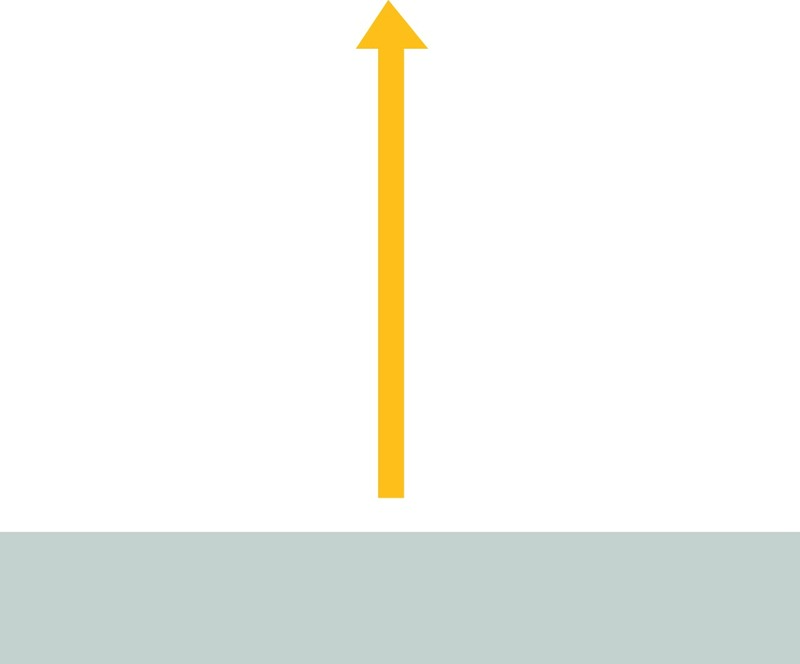 In most cases, daylight factor levels in rooms are measured at work plane height (e.g. 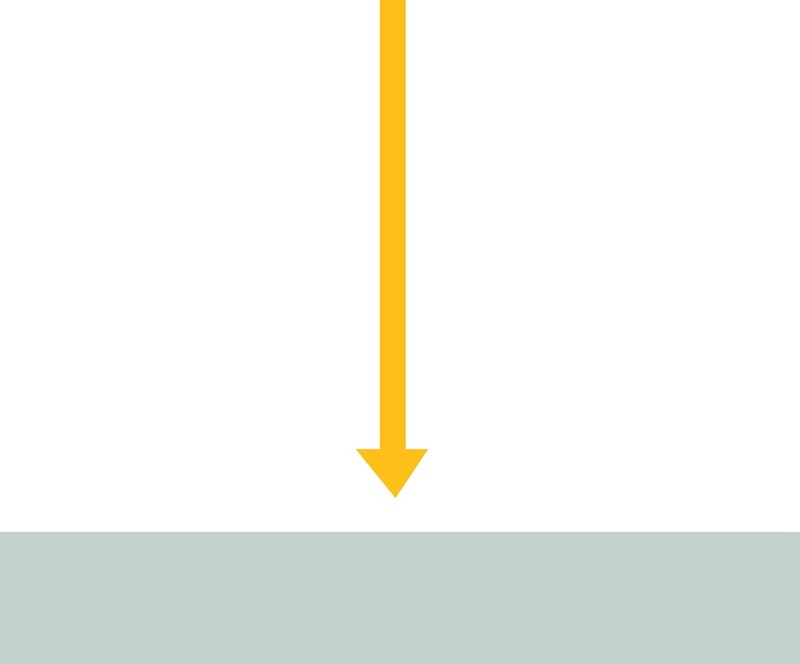 0.85m above the floor), leaving a 0.5m border from the walls around the perimeter of the work plane, as shown in Figure 1.7.10. 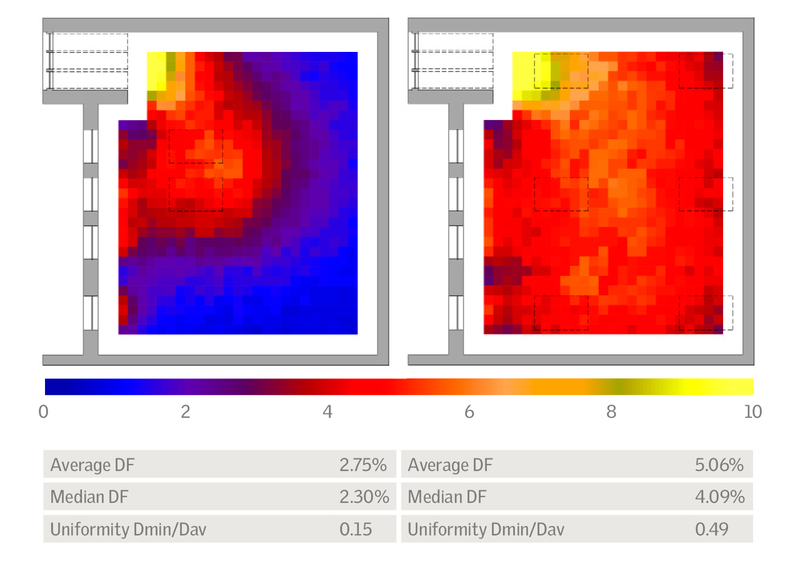 Figure 1.7.10 Daylight factor (DF) simulation in a classroom before (left) and after (right) renovation, including a 0.5m perimeter from the walls around the work plane. The amount of daylight in a building’s interior depends on the availability of natural light outside at that location, as well as the properties of the building spaces and its surroundings. The evaluation of daylight performance should, therefore, take account of the availability of daylight on site in addition to the properties of the space (CIE, 1970). Using recorded climatic data (outdoor diffuse illuminance), we can determine what DF levels will be needed to reach the target illuminance level over a given period of the year. The example below shows how the target DF is determined from climate data to achieve daylight levels of 300 lux for 50% of the year. 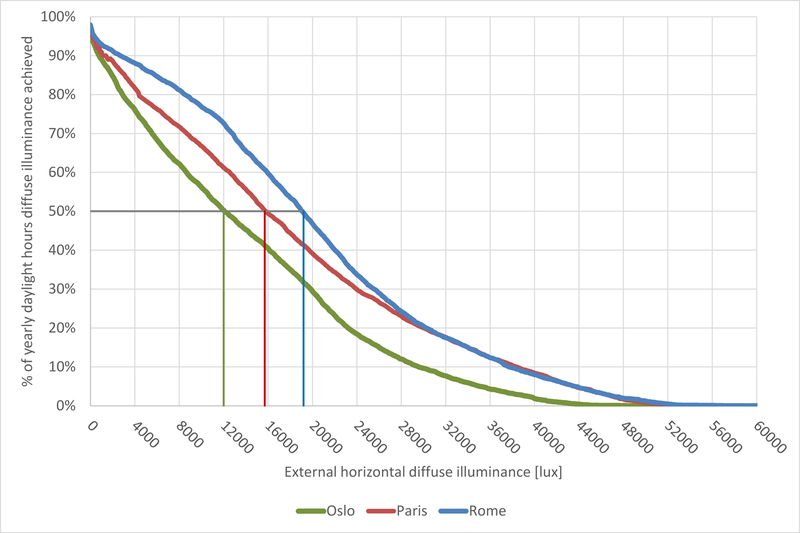 Figure 1.7.11 Cumulative curves of available external diffuse horizontal illuminance for Oslo (Norway), Paris (France) and Rome (Italy). Daylight autonomy (DA) is a daylight availability metric that corresponds to the percentage of the occupied time when the target illuminance at a point in a space is met by daylight (Reinhart, 2001). A target illuminance of 300 lux and a threshold DA of 50%, meaning 50% of the time daylight levels are above the target illuminance, are values that are currently promoted in the Illuminating Engineering Society of North America (IESNA, 2013), see section 1.9.4. Figure 1.7.12 Daylight autonomy (DA) simulation in a classroom before (left) and after (right) renovation, including a 0.5m perimeter from the walls around the work plane. Useful daylight illuminance (UDI) is a daylight availability metric that corresponds to the percentage of the occupied time when a target range of illuminances at a point in a space is met by daylight. Daylight illuminances in the range 100 to 300 lux are considered effective either as the sole source of illumination or in conjunction with artificial lighting. Daylight illuminances in the range 300 to around 3 000 lux are often perceived as desirable (Mardaljevic et al, 2012). 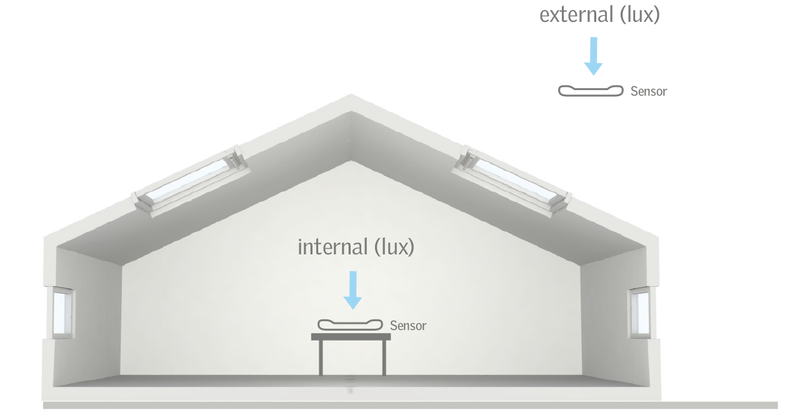 Recent examples in school daylighting design in the UK have led to recommendations to achieve UDI in the range 100-3 000 lux for 80% of occupancy hours. 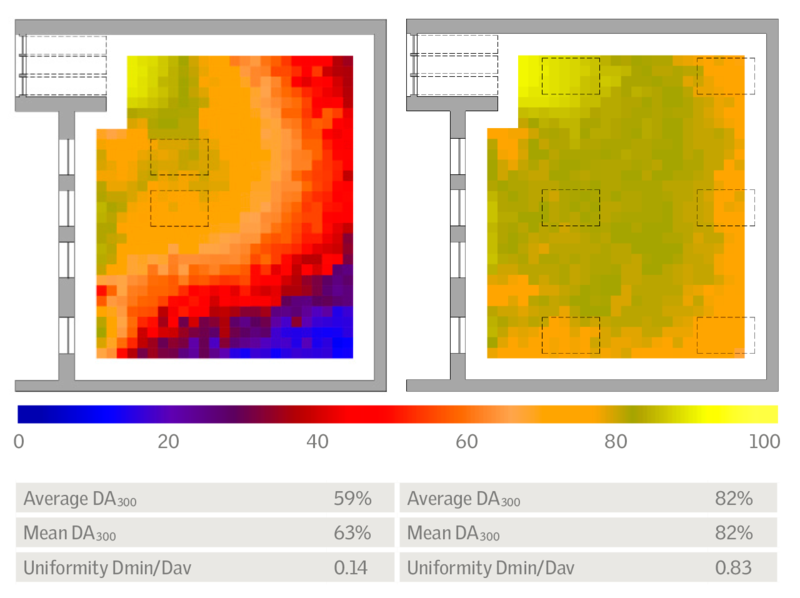 Figure 1.7.13 Useful daylight illuminance (UDI) simulation in a classroom before (left) and after (right) renovation, including a 0.5m perimeter from the walls around the work plane. CIBSE (2002) Code for Lighting, Oxford: Chartered Institution of Building Services Engineers. Hopkins, R. G. (1963) Architectural Physics: Lighting, London: Her Majesty’s Stationery Office.